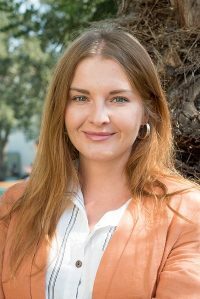 While pursuing undergraduate studies in psychology, in search to satisfy her spiritual thirst to understand a human condition, Anastasia conducted a research project on the topic of Death and Dying. To better understand the research topic, I approached two different cultures – Western and Eastern – represented by the hospice chaplain and the Buddhist monk. From both interviews and additional research, Anastasia discovered that care for dying patients and their families involves more than treatment of physical and psychological symptoms. The treatment also needs to address the mystery of the soul. Also, for several years, Anastasia worked with developmentally disabled individuals and with at risk youth in Mendocino County in California. The HRSA GWEP Alzheimer’s MSW Stipend program at SDSU provided Anastasia with a great opportunity to return to my initial interests in terminally ill and geriatrics populations. Her current internship is at Alzheimer’s San Diego. She is honored to be able to support individuals diagnosed with the forms of dementia and the caregivers. Throughout this year, Anastasia will co-facilitating a weekly Memory Loss support group for those diagnosed with the forms of dementia. She will also have an opportunity to develop a new support group for the LGBTQIA caregivers. In addition, she will provide support to families and co-facilitate Memories in Making social activity class. Moreover, she is excited to participate in a new program development for the agency. Anastasia feels grateful for the learning opportunity that School of Social Work has provided.